Open access means that readers have free access. But who pays for the operational costs of running a publication? Often it’s the authors, though there are several common business models. How much are authors paying? What do they think about it? And what are some other business models to sustain journals and other kinds of digital content? 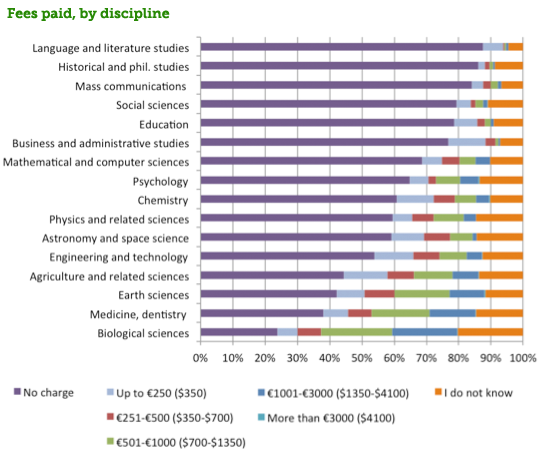 The data for these graphs is from last years’s EC-funded Study of Open Access Publishing (SOAP). The data was collected in winter 2009-10 from N=23k scholars. For more info from the SOAP study, see their slides. Author-pays is just one of many possible income sources to sustain publishing. 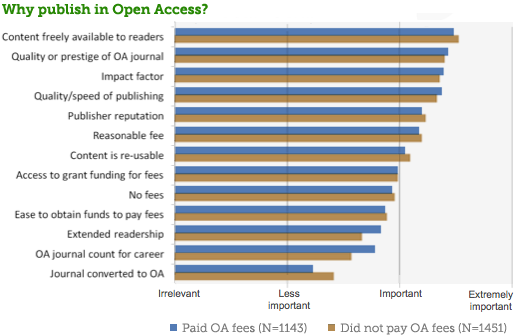 Large publishers are more likely to charge a fee to authors (or their institutions) for each article, though smaller publishers do also. In addition, large publishers often cover expenses with membership fees or paid advertisements. Small publishers tend to draw income from sponsorships, subscriptions, as well as article-related fees for processing, reprints, etc. Traditional Publishing (Toll Access) — The reader/user pays. This was the common model until recently. Payment is proportional to demand, though the actual payment was often paid indirectly, via universities and libraries. Even in the past, this model did not work well for relatively esoteric fields with low demand (e.g., some areas of academic monograph publishing). Author-pays Publishing — Pioneered in scholarly communications by BioMed Central and then copied by PLoS, Hindawi, and now many others including Sage, Wiley, BMJ, and AIP. This turned the traditional model upside down. There are potential conflicts of interest, since the author is the actual customer, but journals can maintain rigorous editorial policies. This works well for narrowly defined communities, where authors and readers work in close collaboration. Institutional Sponsorship — Examples are repositories at colleges and universities. MIT’s DSpace repository is paid for out of MIT funds, and the California Digital Library’s eScholarship service is a budget line for the University of California. Any institution (e.g., a governmental agency) may decide to sponsor a repository or publication program. Anything which is paid out of the operating costs of a parent or separate organization. This includes grant support. Marketing Services — This can include running advertisements, as well as cross promotion. For example, free content drives traffic to web sites, and can also lead to donations or purchased of print versions or other related materials. Advertising support runs the risk of corrupting editorial values, as trade magazines are notorious for receiving kickbacks from advertisers. Another problem is that much scholarly publishing serves audiences that are too small or too highly specialized to attract much interest from marketers. “Freemium” Publishing — Some portion of a service can be made available for free, but other parts will require payment. This is common online. For example, sign up for a free account at LinkedIn, but if you want additional features including broader access to other LinkedIn members, you must subscribe to the professional (meaning paid) version. You can store your files and share them with DropBox, but once the files stored exceed a limit, you will be charged by the amount of storage you require. You may read abstracts of scientific articles as much as you want without cost, but if you want to read the entire article, you either have to purchase the article or subcribe to the journal. Licensing to a secondary market — For example, granting permission for translation into other languages. Much content uses a hybrid model, drawing revenue from multiple sources. For example, the hybrid textbook publisher FlatWorld Knowledge hybridizes marketing services (the availability of the full text of a work online for free) with traditional publishing (the sale of PDFs and print-on-demand editions). The above breakdown is adapted from Joseph Esposito’s ‘What We Talk About When We Talk About Business Models: A Bestiary of Revenue Streams‘ in February 2011. Esposito is a management consultant working in the publishing and software industries. Esposito sees analogies to the entertainment industry: A movie studio can travel across a couple categories over time. Thus the initial release of a film is almost always in the traditional model, with viewers paying for content at theaters. Later the same film may show up on television, where it is used as a marketing service to attract viewers for the benefit of advertisers. Esposito anticipates that we will be seeing author-pays publishing develop a modest additional revenue stream from traditional publishing, with articles originally appearing in open access (author-pays) repositories being collected and edited for publication in books (traditional model). IDEA » Are public supported (crowdfunded) virtual exhibits possible?